TV show dates: March 13, 2018 — present. Performers include: Britt Robertson, Jasmin Savoy Brown, Ben Rappaport, Susannah Flood, Wesam Keesh, Regé-Jean Page, Ben Shenkman, Hope Davis, Vondie Curtis-Hall, and Anna Deavere Smith. 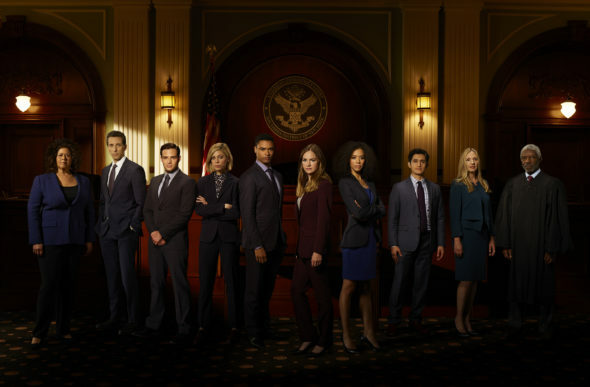 From creator Paul William Davies, the For the People TV show is a Shondaland legal drama. The story unfolds at “The Mother Court,” i.e. the United States District Court for the Southern District of New York. The series centers on six accomplished attorneys, who work on both sides of the law. Whether they represent the defense or the people, these young lawyers ply their trade trying some of the most publicized cases, and in federal court, the stakes can be sky high. Public defenders Sandra Bell (Robertson) and Allison Adams (Brown) are best friends. They work for Federal Public Defender Jill Carlan (Davis), along with their colleague, Jay Simmons (Keesh). Their opponent, Roger Gunn (Shenkman), serves as the chief of the Criminal Division in the United States Attorney’s Office. Gunn oversees prosecutors Seth Oliver (Rappaport), Leonard Knox (Page) and Kate Littlejohn (Flood). Their arguments are heard by Judge Nicholas Byrne (Curtis-Hall), who presides over some of the most controversial cases before the court. Meanwhile, Clerk of Court Tina Krissman (Smith) makes sure everyone stay in line. As their lives overlap outside of court, as well as at work, these young lawyers will face some of the biggest personal and professional challenges of their careers, at the most prestigious trial court in the U.S.A.
What do you think? Do you like the For the People TV series? Should this TV show be cancelled or renewed for another season on ABC? An amazing show. Keep it ok.
Definitely Continue this show- excellent themes, writing and engaging acting. I just finished watching Season 2 episode 2. What a shame you tried to convince the audience that ICE is all bad. Why wasn ‘t it emphasized that he broke the law to come into the country. If we break laws there are consequences. The description of where the little boy would be taken indicating he wouldn’t even have shoes to wear, really? Tell the writers not to push their agenda of border security views into the show and it will be more enjoyable to watch. Cool concept of a new series, don’t blow it.